This article is about the room in Luigi's Mansion. For other uses, see Kitchen. The Kitchen in the Nintendo 3DS remake. 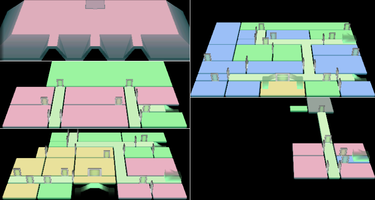 The Kitchen (Japanese: 台所 Kitchen) is a room in the second area of Luigi's Mansion. After Luigi defeats Mr. Luggs, he enters the Kitchen next door. 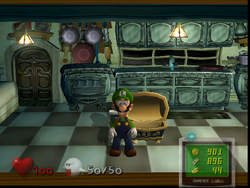 Luigi finds a Flash ghost in the refrigerator and captures it with a Fire Element. After Luigi captures the ghost, the lights turn on and a chest appears with the Water Element Medal. A Speedy Spirit is hidden in the dishwasher. There is a 20% chance that a Gold Mouse will appear the moment Luigi enters the room. If the player uses the Fire Element on the oven, a Ruby will pop out. By using fire on the oven, it is possible to obtain a Ruby from it. In fact, looking at it through the Game Boy Horror will give a hint to relight it. There was originally supposed to be some kind of chef ghost in the Kitchen, but it was scrapped. This page was last edited on November 9, 2018, at 17:57.